The first truss is raised on the Royal Albert Bridge at Saltash, across the River Tamar (top). 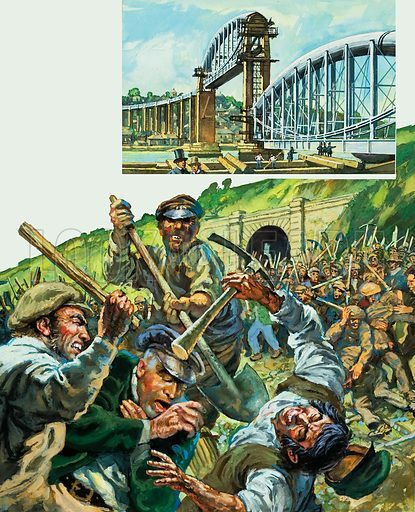 Navvies employed by rival contractors fought fierecely for the right to complete a tunnel through the Cotswolds (bottom). Original artwork for illustrations on p23 of L&L no.1015 (22 August 1981). Available worldwide for immediate download up to 3,603 x 4,441 pixels.